Dynamin 1. De novo mutations in DNM1 coding for Dynamin 1 are increasingly recognized as a cause for epileptic encephalopathies. However, given the role of Dynamin 1 in endocytosis in a large number of cells, the precise mechanisms how mutations may result in seizures are poorly understood. Now two recent publications in PLOS Genetics and Neurology Genetics explore the functional effects of epilepsy-related DNM1 mutations. The publication of both manuscripts is also a timely reminder to announce our international DNM1 study group that has the aim to better understand the phenotype of this disease. The fitful mouse. DNM1 encephalopathy is one of the rare examples where a gene was known from an epilepsy mouse model long before it was identified in humans. The mouse model, referred to as the fitful mouse is a spontaneous mouse mutant that was eventually found to have point mutation in Dnm1 in the middle domain of the DNM1 protein. DNM1 is a GTPase and plays an important role in cutting off the vesicle from the plasma membrane after the neurotransmitter had been released into the synaptic cleft. In our joint publication of the EuroEPINOMICS RES consortium and the Epi4K/EPGP consortium (the E2 working group), we were able to identify 5 patients with de novo mutations in this gene. The fact that two of these patients were followed by our center in Kiel prompted us to look further into the seizure histories, treatment responses and other neurological issues in these patients (see below). In the meanwhile, two publications that were released this summer were able to shed some light onto the molecular and cellular mechanisms of DNM1 encephalopathy. Modelling DNM1 encephalopathy. First of all, the mouse Dnm1 gene works slightly differently than the human gene. 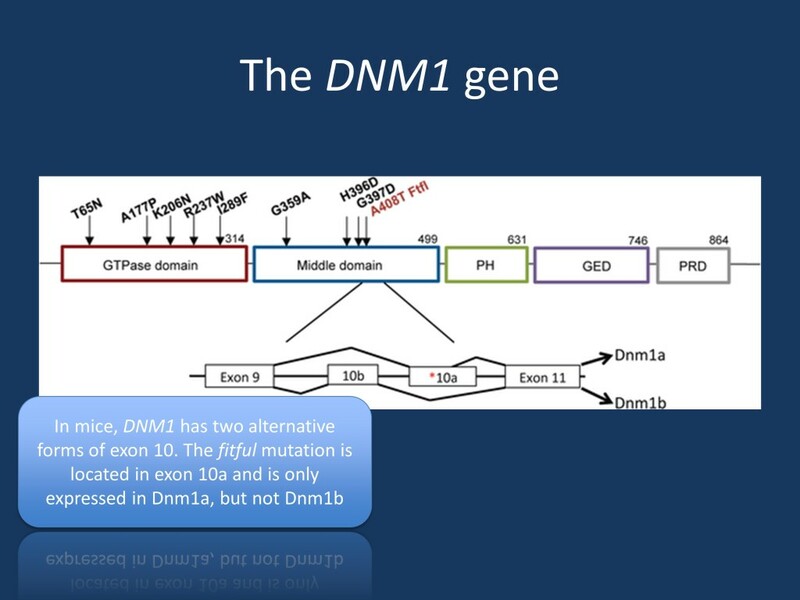 The mouse Dnm1 gene has an alternatively spliced exon, which means that two variants of DNM1 are produced from a single gene. With regards to disease modelling, Asinof and collaborators suggest that the homozygous fitful mouse best recapitulates the heterozygous situation in humans given this alternative exon. Homozygous Dnm1 fitful mice develop severe seizures, ataxia and usually die before the age of 14 days, while heterozygous Dnm1 mice only have a mild epilepsy phenotype that starts at the age of 2-3 months. Type of neuron. The study by Asinof and collaborators aims to investigate the contribution of various neuronal cell types to the homozygous DNM1 phenotype that is thought to model the human heterozygous situation. They use the Cre-lox P method that enables them to cut out part of the wildtype Dnm1 gene in specific neuronal subtypes using specific promotors. For example, when Cre is expressed with a GAD2 promotor, the Cre recombinase cuts out part of the wildtype Dnm1 gene only in GABAergic interneurons, but not in pyramidal cells. Using this method, Asinof and collaborators were able to dissect the phenotypes due to GABAergic and glutamatergic DNM1 deletions. So what did they find? GABA versus glutamate. The main result of the study by Asinof and collaborators can be summarized as follows: when the wildtype Dnm1 is deleted from GABAergic interneurons, the mice develop an epilepsy phenotype. The culprit neurons seem to be parvalbuminergic neurons, a subclass of GABAergic interneurons; gene deletion in these cells alone is capable of producing the same epilepsy phenotype as the deletion in all cells. When expressed in other interneuron subsets, the epilepsy phenotype is milder. But what happens when glutamatergic neurons are affected, not GABAergic neurons? Asinof and collaborators observe that the animals with deletions in glutamatergic neurons using the Emx1 promotor do not develop seizures. However, these animal show abnormal locomotor, exploratory, and repetitive behaviors, suggesting that the glutamatergic gene deletion may in part be responsible for the non-epilepsy phenotypes in humans, such as developmental delay and autism. The authors’ conclusion is that different neuronal cell types in DNM1 encephalopathy may be responsible for different aspects of the disease. The effect of the mutation in GABAergic interneurons is responsible for the epilepsy phenotype, while the effect of the mutation in glutamatergic pyramidal cells may be responsible for the developmental delay, autism, and other behavioral features that patients with DNM1 encephalopathy may have. Dominant negative. In the publication by Dhindsa and collaborators, the functional effect of DNM1 mutations on vesicle endocytosis was evaluated. The manuscript was published in the very first issue of Neurology Genetics, a brand new open-access journal from the Neurology family that was launched in June 2015. Dhindsa and collaborators find strong evidence that most mutations described in patients with DNM1 encephalopathy have a dominant-negative effect. They use uptake assays in HeLa and COS-7 cells, which are useful models to test endocytosis as these cells use DNM1 for this process. When the authors added DNM1 proteins that carried any of the encephalopathy mutations, they could show that endocytosis is impaired. As the basic cellular DNM1 protein was still present, this could only mean that the additionally transfected mutant proteins interferes with the normal function of DNM1; that is, it works in a dominant-negative way. Dhindsa and collaborators also showed that vesicles in the fitful mice are larger than in wildtype animals, suggesting that the fitful mutation interferes with the scission function of DNM1. In other words, the mutation interferes with the cell’s ability to separate vesicles from the plasma membrane. DNM1 study group. We are currently trying to gather as much clinical information on patients with DNM1 encephalopathy in our DNM1 study group and were able to already identify multiple additional patients with de novo mutations in DNM1. If you are aware of other patients who are not yet included in this cohort, please let us know (email). We’re trying to collect as much data as possible to better understand this rare severe epileptic encephalopathy. What you need to know. De novo mutations in DNM1 are a cause of severe epileptic encephalopathy that presents with Infantile Spasms. Two recent publications query the functional consequences of DNM1 mutations and find that the seizure phenotype is largely due to the deleterious effects of DNM1 mutations in GABAergic interneurons, while behavioral phenotypes may be due to the effect of the mutation in pyramidal cells. The mutations seen in patients with epileptic encephalopathies act in a dominant-negative manner and results in less efficient vesicle endocytosis. GABAergic interneurons may be particularly prone to a disruptions of this function given their fast firing frequency. Also thank you to the authors for publishing both manuscripts in Open Access Journals. This entry was posted in 2015, Consortia, Epilepsiome, Epileptic encephalopathy, Papers and tagged DNM1, DNM2, Dynamin 1, E2 consortium, endocytosis, EPGP, Epi4K, EuroEPINOMICS, Infantile Spasms, Lennox-Gastaut Syndrome, SNARE complex, STX1B, STXBP1, West Syndrome. Bookmark the permalink.